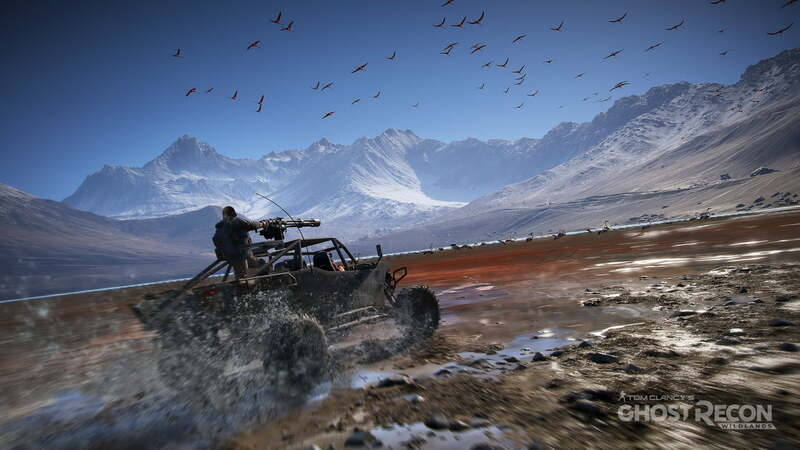 There are two games at war within Tom Clancy’s Ghost Recon: Wildlands. 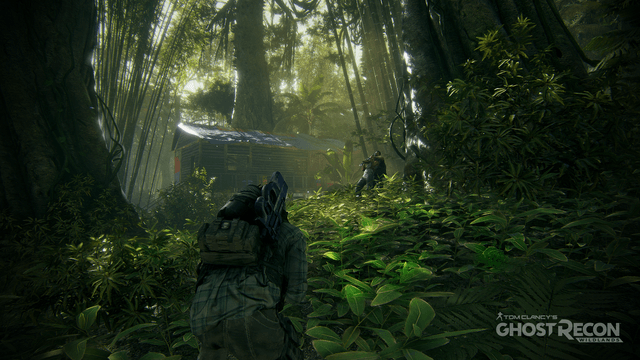 One, a precise, team-based tactical shooter honoring the spirit of the Ghost Recon franchise, is interesting but malformed. The other, a physics-based open-world romp in the style of Mercenaries and Just Cause, is stupid, but also hilarious. 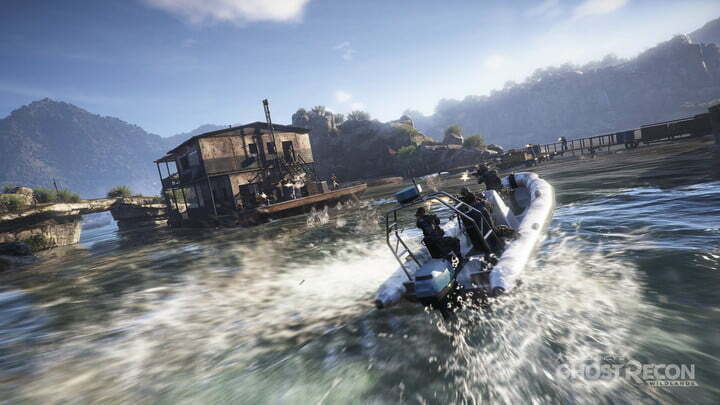 The trouble is that Ghost Recon isn’t good at being both things at once. Taken at face value, it’s impossible not to see the game’s shortcomings. It lacks the polish necessary for a game based on precision, its open world seems designed to waste your time, and its premise can feel … problematic. 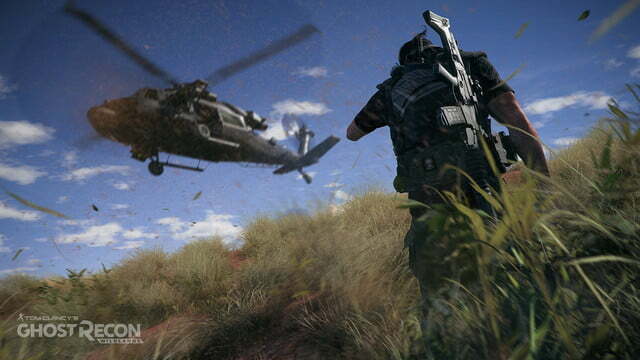 On the other hand, when played purely for open-world absurdity, Ghost Recon feels derivative and a bit shallow. 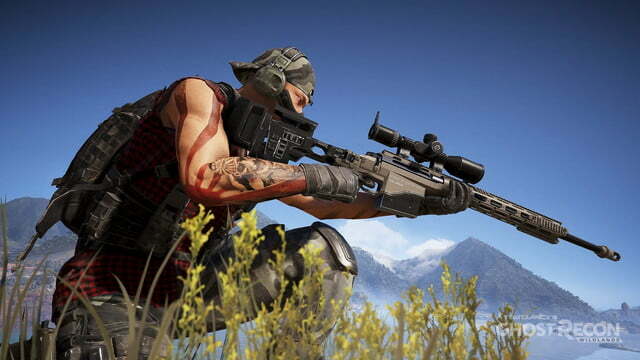 But despite Ghost Recon’s identity crisis, both visions for the game have their merits. The concept of careful, open-world teamwork endears itself to one breed of player, the insane, open-world nonsense that endear this class of games to another. Ghost Recon specifically works to tap both. It wants you and three buddies to go on a helicopter-flying rampage across a huge space, or to sneak carefully and quietly into an enemy base while calling out locations of “tangos” to one another with military speak picked up from action movies. When it can deliver either of those two ideas, it’s pretty fun. But it often fails on both counts, dragged down by faulty mechanics that straddle the two. 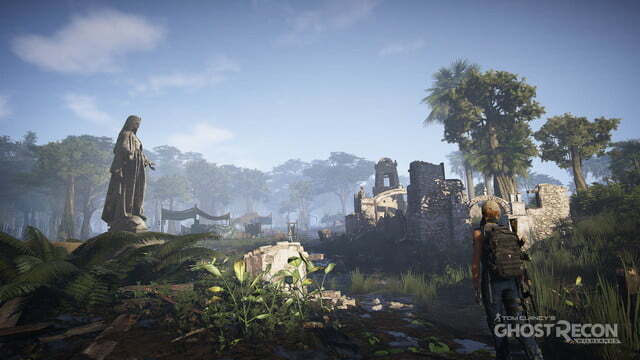 With the Tom Clancy brand, Ubisoft has lately gone hard on the idea of small groups of highly trained soldiers, operating with impunity in civilian-populated lands. Ghost Recon: Wildlands is about four such soldiers running covert missions in Bolivia, the goal of which is to destabilize and ultimately destroy a massive, country spanning drug cartel. The loop is pretty simple. Each Bolivian province is controlled by a local boss. You gather intel to unlock missions, which often revolves around infiltrating (or sieging) cartel bases. Finish enough missions and you can capture or kill the boss. Kill enough local bosses, and an “underboss” — someone higher up on the food chain — comes out of hiding, so you can do the same thing to them. In true open-world style, though, there are other things to distract you. Securing supplies for the local rebellion opens up the ability to upgrade your squad, your gear, and yourself. Completing side missions opens up things like calling for mortar support or summoning a vehicle to your location. Eventually, you’ll have a fair number of options at hand when you assault a position — and you’re almost always assaulting positions — although the best remains careful stealth. Coincidentally, the game’s stealth mechanics are among the major issues dragging Wildlands down. Despite its wide world, you will spend the majority of your time in this game sneaking into buildings and either killing people or blowing stuff up. Ghost Recon is only “good” under very specific circumstances. If you want to have any hope of success, you’ll follow the same set of actions in most cases. 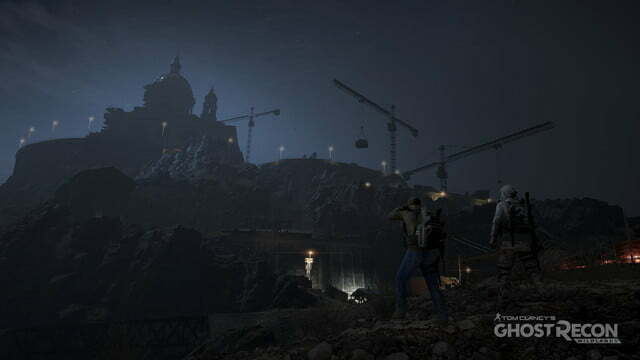 You’ll stand outside the base, using binoculars or a handy drone to “mark” enemies throughout the engagement area. Once they’re identified, you’ll carefully pick off the ones separated from their buddies, or use your squad’s “sync shot” ability to simultaneously drop up to four baddies before they can inform their friends. Then you’ll move in and complete your objective. Without spotting enemies in advance, they’re much tougher to deal with, so the “recon” aspect of Ghost Recon is still pretty important. And of course, there are alarms and reinforcements to deal with if you screw up and get spotted. Repetitious though it may be, the stealth can definitely be satisfying. A well-prepared mission can go off without a hitch (doubly tough to pull off with a team of human players, but also doubly satisfying). Salvaging a mission after making a mistake can also be quite rewarding. 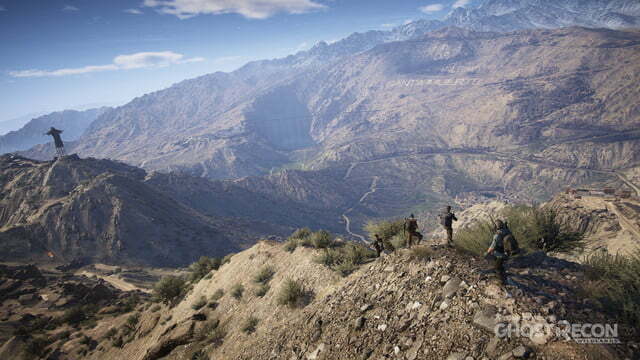 When you’re coordinated and smart, Ghost Recon’s constant team of four guys (whether controlled by artificial intelligence or other players) offers something a little different from other open-world games. But if you try to play Wildlands all the way through with a straight face, you probably won’t make it. There are tons of little annoyances to get in the way. The story is flat; the characters are cardboard, and much of the plot and lore trades in stereotypes and gross militarism. The game map is absolutely enormous, and it takes minutes to reach any given objective. 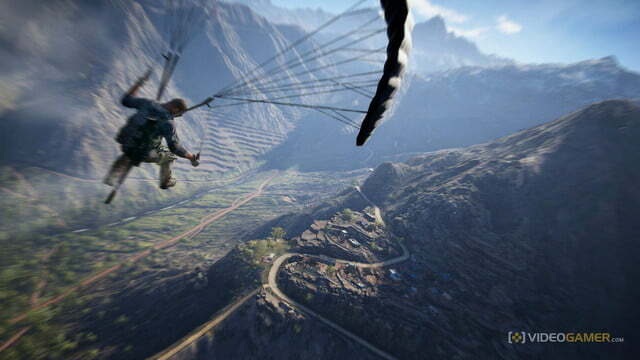 Even with liberal use of “fast travel,” which lets you warp between safe houses in each of Bolivia’s provinces, the time spent finding helicopters to help mitigate the irritating drive times always feels like a sunk cost. It doesn’t help that Wildlands isn’t especially well polished (although with a game this huge, bugs were always going to be a part of the experience). It’s easy to get hung up on geometry, see your team floating in the air at points, or to catapult yourself off a motorbike and go flying for a mile for some reason. 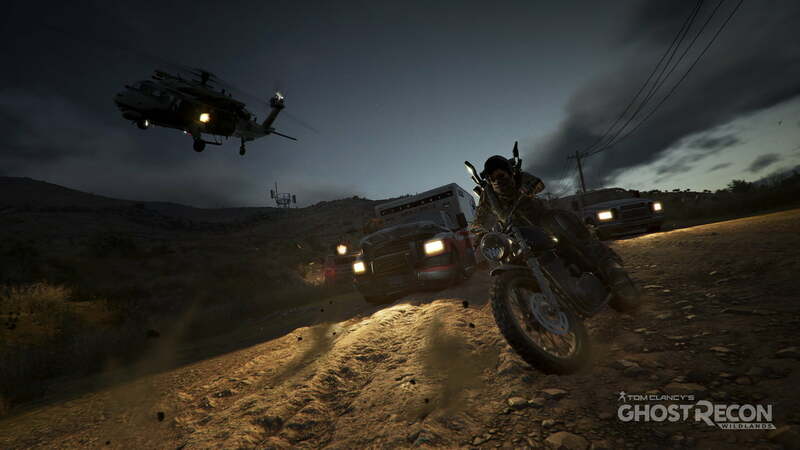 Better to take Ghost Recon as it is: the bonkers cousin of Tom Clancy’s The Division, a four-player Grand Theft Auto-like title that’s focused on those moments where you take a rocket launcher to a police helicopter just to stir the pot. Listen closely to enough of the dialogue in Wildlands, and you start to realize the game doesn’t take itself quite as seriously as you might think. Your character will repeatedly shout “s–tballs” after a screwup. In one interrogation, he yells “Pork barrels, f–kface!” when explaining why, as an employee of the cash-flush and money wasting US government, he couldn’t be bribed. In a briefing on one of the local bosses, your CIA handler explains how she’d really like to have some intimate time with the target, a singer whose lyrics focus on the cocaine trade. 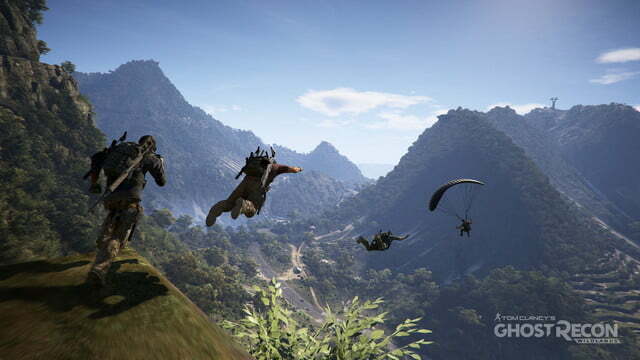 Putting four people into a giant open world like this is a recipe for chaos, and that’s exactly what Ghost Recon is going for. Sure, you can carefully sneak up on a base, identifying all the enemies, sniping each one as a coordinated team of special ops powerhouses. Or you can crash a helicopter in the middle of it all and start firing grenades at anything that moves. Or someone can crash the gate with a tank while you strafe in a helicopter. Or you can you jump out of the helicopter’s pilot seat and drop in by parachute. Ubisoft is taking advantage of gameplay between its missions in a way it hasn’t before. 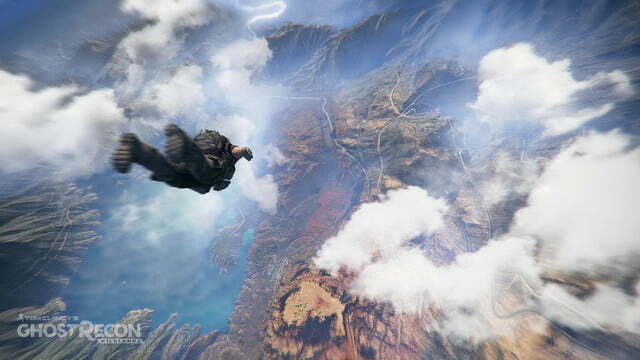 Though the publisher, which makes the Assassin’s Creed, Far Cry, and Watch Dogs series, has been making open worlds for years, Wildlands gives players more opportunities to cut loose with as much insanity as possible. The game often echoes this tone with goofy dialogue and less-than-serious attitude. And when played that way, with a squad of friends thinking the same way (the single player is much less conducive to nonsense, although you can get away with some), Ghost Recon offers something unique and hilarious. 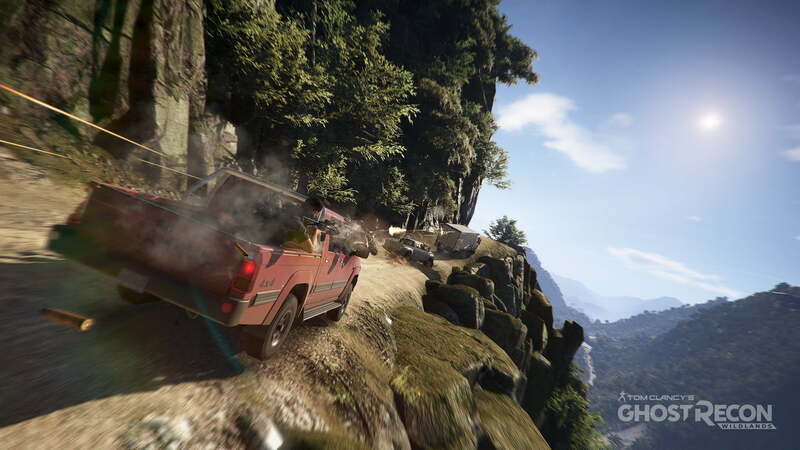 It’s not just a ridiculous open world, it’s a ridiculous four-player open world. There’s a certain joy to be found in that, just like there’s a certain satisfaction to teaming up with three buddies and becoming a well-oiled four-person murder machine. Is it ludicrous nonsense? Absolutely. It’s impossible not to see the game’s shortcomings. But that means Ghost Recon is only “good” under very specific circumstances. As a single-player open world experience, it drags and grates. The world is too big by a huge margin, mostly serving to waste your time on boring travel. The missions oscillate between repetitive and frustrating, especially during single-player sequences. Your AI-controlled squad just cannot force a car to the side of the road without killing the driver, which is often exactly what you need to do. Similar to Ubisoft’s last modern military game, The Division, Wildlands’ premise and plot swerves into some unsettling political statements. Effectively, your Ghost Recon team is an unauthorized military force wandering around a foreign nation, shooting whoever you like. The game chastises you for killing civilians with a “hey, you bozo!” kind of attitude. The radios, which turn on whenever you get in a car, are awash with Mexican stereotypes (the cartel is a Mexican transplant). For all of its silliness, there are also moments where its brotastic jokes and quite self-righteous ooh-rah militarism feels earnest and unsettling. 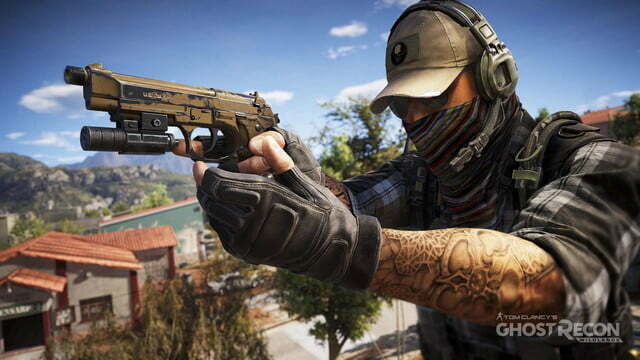 But, more often, Wildlands cuts the bite of that political insensitivity with humor and the potential for zany gameplay. And that’s never more true than when you add other people into the mix and start jumping tanks off ramps and launching yourself over the handlebars of motorcycles. Throw in some pals and a wanton disregard for Bolivian sovereignty, and Ghost Recon at least has some redeeming qualities. Ghost Recon: Wildlands injects a nonsensical open world sense of humor into the normally self-serious Tom Clancy brand. When taken like that — instead of being a superserious soldier fantasy about illegally killing drug lords in a real South American country — it can be pretty fun. That doesn’t excuse the game for being uneven and schizophrenic, though. Even the story can’t be sure if it’s a lighthearted absurd take on the Tom Clancy brand or a more serious, and often kind of gross, realistic pro-military drama. But that Ghost Recon: Wildlands oscillates at all pushes it ahead of similar recent fare like The Division. I choose to believe that this is Tom Clancy trying to go off the leash and be ridiculous. With three other people treating it the same way, there’s fun to be had. 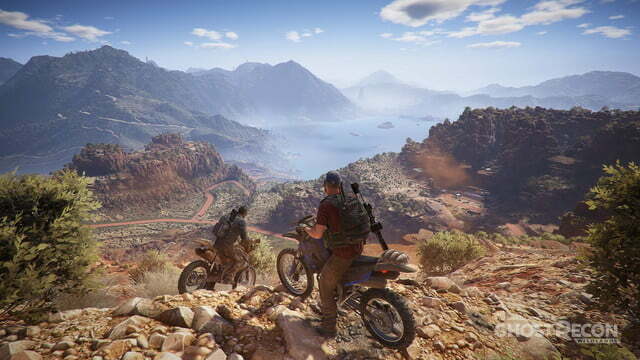 Ghost Recon: Wildlands achieves a very specific thing: it puts you and three other players in a massive open world. Other games that get close, like Destiny or Tom Clancy’s The Division, don’t really deliver on that GTA-style freedom. So there are other open worlds out there — Far Cry 4, Grand Theft Auto V, Watch Dogs 2, or even The Legend of Zelda: Breath of the Wild — but they don’t deliver exactly what Ghost Recon does. Forever. Wildlands is absolutely huge. Even doing the bare minimum by yourself, which requires killing half the bosses, will take more than 20 hours. Some of that run time is padded by irritations like traveling, which is often a pain. But there’s absolutely a huge amount of stuff to do, even if actually doing it gets somewhat repetitive. If you have a plan to play the game with three friends who are similarly committed to either tactical infiltrations or modern military hijinks, Wildlands is worth a shot. If you’re planning to play the game solo, or don’t take any joy in comical aspects of open-world jankiness, this game is not for you.